New Orleans Pelicans point guard Tyreke Evans (1) celebrates after hitting a shot to take the lead with 1.2 seconds remaining in the fourth quarter of a game against the Portland Trail Blazers at the New Orleans Arena. 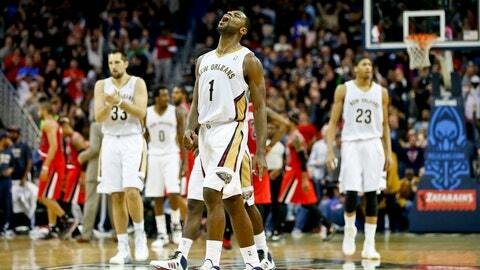 The Pelicans defeated the Trail Blazers 110-108. The New Orleans Pelicans close out 2013 with a statement 110-108 win over the Portland Trailblazers and high goals for 2014, given the ways this young team is now finding ways to win. Point guard Jrue Holiday is a veteran voice on the court who can carry the team on his back when needed, as he did in the 4th quarter of the matchup with the Trailblazers. Holiday recorded 15 of his season-high 31 points in the final period when some of his teammates seemed to be losing steam. Holiday also had 13 assists. "I knew that I could come out and hit my shots," Holiday said. "I just felt good and it came at a good time." Swingman Tyreke Evans is making clutch seem normal, almost expected, as evidenced most recently by his game-winning pull-up jumper from 17 feet away Monday with just 1.2 seconds left on the clock. "I just came down," Evans said. "I knew I had to be aggressive and make a tough shot. I had to keep my confidence up and shoot the ball." The Pelicans win over the dominating Trailblazers is even more impressive given they were without two starters, shooting guard Eric Gordon (hip contusion) and center Jason Smith (left shoulder). The Trailblazers are just the 5th team in the last 20 years to score 105 points every game in December, yet the Pelicans found a way to overcome, owning the battle in the paint. Ryan Anderson’s three-point accuracy has proven key in the outcome of the Pelicans’ face-offs this season, since he returned from a chipped toe. Anderson is averaging 4.3 three-point makes per game in 10 wins this season, while recording 2.2 three-pointers per contest in nine losses. Perhaps though the most encouraging sign for 2014 and beyond is that we’re just now mentioning power forward Anthony Davis, who is the cornerstone of this franchise. Davis finally has weapons around him; teammates who make him better and help carry the load. Davis finished Monday’s rematch with Portland by recording 27 points, 12 rebounds and 5 blocked shots. Davis, or "A.D." as he’s known to the team, has grown tremendously since last season and his ceiling still isn’t in sight. Davis is learning to flex his offensive and defensive muscles. The second-year pro now leads the NBA in Fourth Quarter field goal percentage, shooting .656 on 42-of-64 attempts. A side bonus for the Pelicans, Anthony Morrow isn’t too far behind. Meanwhile, Davis is also consistently one of the league’s leaders in blocked shots. He entered Monday’s game ranked 1st in the league in blocked shots per game at 3.1. Pelicans head coach Monty Williams coached LaMarcus Aldridge for 4 years during his days as an assistant coach in Portland. Williams saw much of Aldridge in Davis from Day 1. "I told AD after the Draft, that’s who I wanted him to be like," Williams said. "They’re so similar. LaMarcus strokes it better, but that will come in time for AD. LaMarcus was just like AD when he was young. AD can be just like LeMarcus, or better, if he works hard." Aldridge is now 28. Davis is 20. "If someone wants to compare me to Aldridge or say I can be like him, I’ll take that as a huge compliment," Anthony Davis said. "He’s one of the best in the league." Entering 2014, Williams says his team has turned a corner on the season. "Yes and I temper it with this: When you have young guys, it is extremely difficult to get them to understand how to win games against really good teams," Williams said. "I know we can be this and more. I thought our defense could have been better as far as covering up a few three-pointers. I think this is where we can be and more. We have had signature wins this year, but for me, it is how we respond. We have this win against maybe the best team in the NBA, how we approach tomorrow’s practice and how we approach our shoot around the next day will be important." The Pelicans’ first challenge in 2014 is a 4-game road trip that starts in Minnesota against the Timberwolves on New Year’s Day, then sends them to Boston, Indianapolis and Miami.